‘Coming Soon‘ plays with ‘what you see is what you get’ as a visual paradox–clarity at the helm of structure reading into a different matrix. The field of black with a gray, objectively, sits bare. The gray outline rests hard against the left side and the bottom. It doesn’t make it to the other side. The structure of the canvas shape stays with us at a very much frontal involvement. The gray lines initially read as solid and steady. They are painted thickly, straight, and are quite wide. The panting pulses at the subliminal. 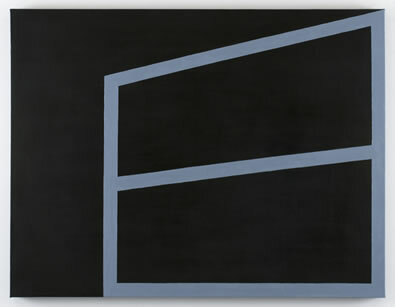 The gray moves the black into an ongoing movement with space. The boldness of the decisions rest surely. However the length it takes to engage the coordinates positions us outside reliability, and back again, to a place of dynamic rest, complexly unraveling the simple, the sturdy, and light. Brent: A small work of yours was exhibited here at Bus-Dori, Tokyo this Spring. Of course, over the internet I could see the structure. And that’s what really excited me. In reality it was also very interesting to notice how my body moved in. What kind of painting experience is that? The black ‘ground’ reads incredibly lush despite being evenly laid down. At the same time the feel is that the object is something akin to powder-coated iron. The edges are painted so you have this slab that reads almost impenetrable, but then it shifts. The line work appears very casual, it’s thick oil paint. You can see the pulls and curl. But also the lines are generally incredibly straight. Every aspect of the painting seems mysterious for the use of opposites. How are you thinking when you lay the paint out? Karen: I do think a lot about how my body feels in relation to painting/sculpture/installation work. In general, and maybe especially because of the practice of yoga, I hold what’s called “the wisdom of the body” in great esteem. Sometimes I feel that my body is much more intelligent and aware than my intellectually-focused brain, and that I need to bring them into alignment. This is what meditation seems to do, and I think that the process of painting is a kind of meditation. Experiencing painting on a wall involves seeing, but also almost meeting the experience with one’s body, feeling it inside and noticing how it makes one ‘re’balance, feel gravity, mass, light, space. ‘Proprioception‘ is a great word that speaks to this. I think of my paintings as flat planes that are also objects. I try not to get stuck in dualities, but somehow live in the middle space so I can show both realities simultaneously. 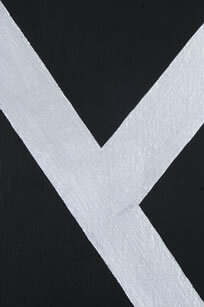 So I put on paint deliberately, allowing the substance to be there, but not ruling the lines with tape. I usually measure out the shapes after first feeling them out “by eye”( which really has to do with an inner sense of the right proportion) . Then I paint by hand, so that the touch is evident and time-based. I guess that overall I feel that life, (and art) are not necessarily logical experiences even though we want to make them understandable and therefore controllable through dualistic thinking. To get to my own truth, I try to allow all those oppositions to coexist so that maybe I can gain insight from the spaces in between. Tags: Body, Karen Schifano, Line, Painting, Space, Structure. Bookmark the permalink. I enjoy these works of Karen enormously – they seem to pump new blood into that poor old bedraggled phrase ‘between fact & fiction’.